The title of this book made me want to read it. The first two sentences made me want to read it even more. 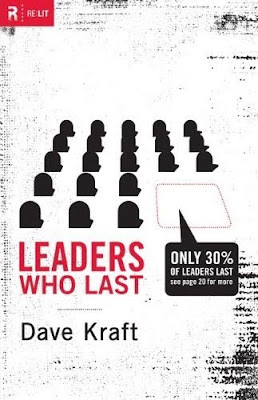 In his foreword, Mark Driscoll writes: “Pastor Dave Kraft is in the right season of life to write this book. By the time this book is published he will be seventy years of age” (p. 11). That was enough to make me want to listen, and listen hard, to what this man had to say. So, I read the book in three different sittings in a thirty-six hour time frame. I’m glad I did. Dave Kraft is a good writer, with a simple, straightforward style. The book is clear and confident. Kraft knows what he wants to say to leaders and says it. I was immediately drawn in with the book’s clear flow-of-thought, which is evident from the contents. The chapters are short, to the point, and seasoned with good illustrations and striking quotations of leaders from a variety of different contexts. For example, here’s a great quotation about character from the legendary coach, John Wooden: “Be more concerned with your character than with your reputation, because your character is what you really are while your reputation is merely what others think you are” (p. 98). There are lots of these leadership maxims scattered through the book, so read with a highlighter handy. You’ll want to remember some of these. These, however, are just a few of the gems found in this wise and helpful book. Most of the chapters also include helpful, practical advice about how to implement the principles being taught. For example, the chapter on priorities (building on the previous chapters) outlines an eight step process for determining how and where to spend your time, moving you through purpose, passion, goals, plans, priorities, schedule, execution, and evaluation. It’s a fairly simple approach, but it’s doable – as is all the other advice Kraft gives. So, I highly recommend this book. Though it is a brief book and doesn’t say everything that can or should be said about leadership, what it does say is said well and sticks. Kraft’s Leaders Who Last has a quality similar to J. Oswald Sanders’ classic Spiritual Leadership from a generation ago. If I could summarize what I appreciate most about this book into three brief things it would be these: (1) There is a strong emphasis on depth of personal devotion to Jesus, out of which flows everything else. (2) There is a strong emphasis on multiplying leaders. (3) It is written by someone who has done it for over forty years. ‘Nough said. NOTE: If you found this review helpful, give me a helpful vote on Amazon by clicking here.